Together with a team of six athletes from Moldova we are at the Euro-Asian Taekwon-Do Championship on the island of Cyprus. 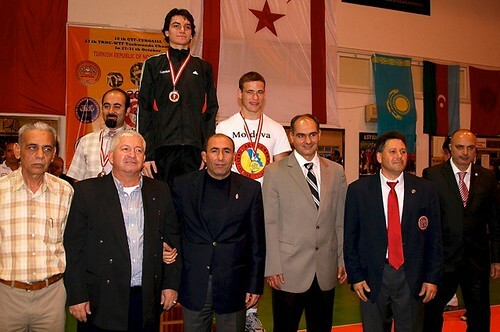 Yesterday, October 29, 2010 the WTF (World Taekwon-Do Federation) competition took place. Our club, “Stolas Leukas ”, decided to try our forces fighting according to the rules of WTF style for the first time. Yesterday, two of our athletes participated: Gennady Bitco (II Dan) and Sandu Aprodu (I Dan). To our great joy, Gennady Bitco took the second place in this style. Today the GTF (Global Taekwon-Do Federation) competitions, the style we practice, will be held. Thanks to all who support us in prayer. We pray God to give us victory for His glory and for the honor of our country that we represent here.